It’s suspected other adverse reactions observed in our studies were due to A10. They weren’t observed by Buckner et al since they used approximately 50 times lower dosages of A10 in their study. 49. Burzynski SR. Efficacy of antineoplastons A10 and AS2-1. 48. Buckner JD, Malkin MG, Reed E, et al. Phase II study of antineoplaston A10 (NSC 648539) and AS2-1 (NSC 620061) in patients with recurrent glioma. Mayo Clin Proc. 1999;74:137-145. Mayo Clin Proc. 1999 Feb;74(2):137-45. Department of Oncology, Mayo Clinic Rochester, Minnesota, USA. Burzynski, S.R., Lewy, R.I., Weaver, R., Janicki, T., Jurida, G., Khan, M., Larisma, C.B., Paszkowiak, J., Szymkowski, B.
Burzynski, S.R., Weaver, R.A., Janicki, T.J., Burzynski, B., Jurida, G. Targeted therapy with ANP in children less than 4 years old with inoperable BRAIN STEM GLIOMAs. Neuro-Oncology. 2005; 7:300. Weaver, R.A., Szymkowski, B., Burzynski, S.R. Over a 10-year survival and complete response of a patient with diffuse intrinsic BRAINSTEM GLIOMA (DBSG) treated with antineoplastons (ANP). Neuro-Oncology 2009; 11:923. Clin Chim Acta. 2013 Apr 18;419:52-6. doi: 10.1016/j.cca.2013.01.016. Epub 2013 Feb 8. Department of Pediatrics, Takarazuka City Hospital, Takarazuka, Japan. Phenylacetylglutaminate (PAG or PG) and PHENYLACETATE (PN) are metabolites of Phenylbutyrate (PB) …..
↵1 Supported by Elan Pharmaceutical Corporation Grant G174ED. 12. Rimoldi, D., Srikantan, V., Wilson, V. L., Bassin, R. H., and SAMID, D.
Increased sensitivity of nontumorigenic fibroblasts expressing ras or myc oncogenes to malignant transformation induced by 5-aza-2′-deoxycytidine. Cancer Res., 51: 1-7, 1991. 6. SAMID et al., unpublished observations. SAMID, D., Yeh, A.. and Prasanna. P.
SAMID. D., Shack. S., and Myers, C. E.
J Clin Invest. 1993 May; 91(5): 2288–2295. This study was supported by Elan Pharmaceutical Corporation grant G174ED. 9. SAMID, D., D.M. Flesate, and R.M. Friedman. 1987. Interferon-induced revertants of ras-transformed cells: resistance to transformation by specific oncogenes and retransformation by 5-azacytidine. Mol. Cel. Biol. 7:2196-2200.
a novel nontoxic inducer of tumor cell differentiation. Cancer Res. 52:1988-1992. 14. SAMID, D., A. Yeh,and P. Prasanna. 1992. Induction of erythroid differentiation and fetal hemoglobin production in human leukemic cells treated with PHENYLACETATE. Blood. 80:1576-1581. 17. Dover, G.J., S. Brusilow, and D. SAMID. 1992. Increased fetal hemoglobin in patients receiving sodium 4-phenylbutyrate. N. Engl. J. Med. 327:569-570. 33. Mandler, R., D. Rimoldi, K. Kariko, and D. SAMID. 1991. Urokinase-type plasminogen activator in experimental metastasis of human osteosarcoma cells. Cancer J. 4:316-321. 34. Rimoldi, D., V. Srikantan, V. L. Wilson, R. H. Bassin, and D. SAMID. 1991. Increased sensitivity of nontumerogenic fibroblasts expressing ras or myc oncogenes to malignant transformation induced by 5-aza-2-deoxycytidine. a novel nontoxic inducer of tumor cell differentiation. Cancer Res., 52: 1988-1992, 1992. 8. SAMID, D., Yeh, A.. and Prasanna. P. Induction of erythroid differentiation and fetal hemoglobin production in human leukemic cells treated with PHENYLACETATE. Blood, 80: 1576-1581. 1992. 9. SAMID. D., Shack. S., and Myers, C. E. Selective growth arrest and maturation of prostate cancer cells in vitro by nontoxic, pharmacological concentrations of PHENYLACETATE. J. Clin. Invest., 91: 2288-2295, 1993. 6. A. Thibault et al., A phase I and pharmacokinetic study of intravenous PHENYLACETATE in patients with cancer, submitted for publication. Clinical Pharmacology Branch, National Cancer Institute, NIH, Bethesda, Maryland. 9. SAMID, D., Yen, A., and Prasana, P. Induction of erythroid differentiation and fetal hemoglobin production in human leukemic cells treated with PHENYLACETATE. Blood, 80: 1576-1581, 1992. 10. SAMID, D., Shack, S., and Myers, C. E. Selective growth arrest and phenotypic reversion of prostate cancer cells in vitro by nontoxic pharmacological concentrations of PHENYLACETATE. J. Clin. Invest., 91: 2288-2295, 1993.
resemblance to fetal brain damage in phenylketonuria. Cancer Res., 54: 891-895, 1994.
receiving sodium 4-phenylbutyrate. N. Engl. J. Med., 327: 569-570, 1992. 13. BURZYNSKI, S. R., Kubove E., Burzynski, B. Treatment of hormonally refractory cancer of the prostate with antineoplaston AS2-1. Drugs Exp. Clin. Res., 16: 361-369, 1990. 6/1/1994 – Growth inhibition, tumor maturation, and extended survival in experimental brain tumors in rats treated with PHENYLACETATE. Surgical Neurology Branch, National Institute of Neurological Disorders and Stroke, NIH, Bethesda, Maryland. tumor cell differentiation. Cancer Res., 52: 1988-92, 1992.
hemoglobin production in human leukemic cells treated with PHENYLACETATE. Blood, 80: 1576-81, 1992.
of PHENYLACETATE. J. Clin. Invest., 91: 2288-2295, 1993. 4. SAMID, D., Ram, Z., Hudgins, W. R., Shack, S., Liu, L., Waibridge, S., Oldfield, E. H., and Myers, C. E. Selective activity of PHENYLACETATE against malignant gliomas: resemblance to fetal brain damage in phenylketonuria. Cancer Res., 54: 891-895, 1993.
cancer of the prostate with antineoplaston AS2-1. Drugs Exp. Clin. Res., 16: 361-9, 1990. 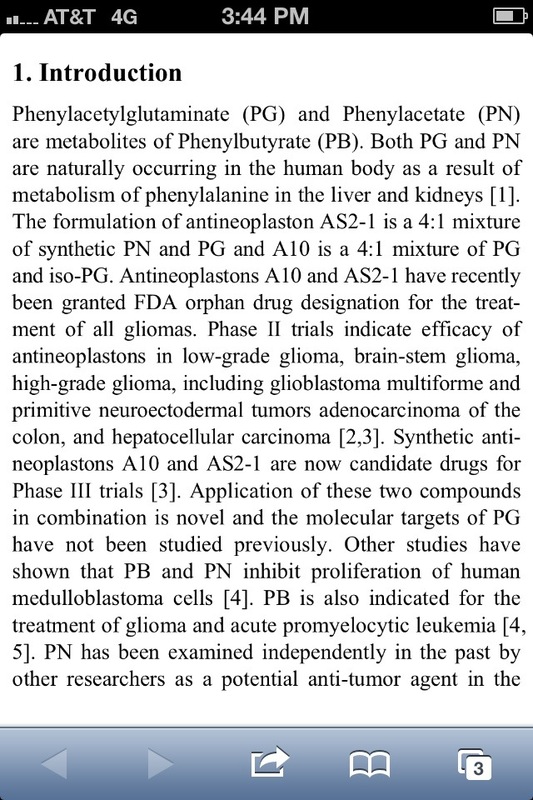 2/8/1995 – PHENYLACETATE synergizes with retinoic acid in inducing the differentiation of human neuroblastoma cells. Department of Pathology and Laboratory Medicine (Neuropathology), UCLA School of Medicine. 4/1995 – Disposition of phenylbutyrate and its metabolites, PHENYLACETATE and phenylacetylglutamine. 9/27/1995 – Increased susceptibility of ras-transformed cells to PHENYLACETATE is associated with inhibition of p21ras isoprenylation and phenotypic reversion. Clinical Pharmacology Branch, National Cancer Institute, Bethesda, MD, USA. 10/1995 – Inhibition of proliferation and induction of differentiation in medulloblastoma and astrocytoma-derived cell lines with PHENYLACETATE. Cotzias Laboratory of Neuro-Oncology, Memorial Sloan-Kettering Cancer Center, New York, New York, USA. Biochem Pharmacol. 1995 Oct 12;50(8):1273-9. Synergistic activity of lovastatin and sodium PHENYLACETATE against human glioma cells. Clinical Pharmacology Branch, National Cancer Institute, Bethesda, Maryland, USA. 5/1996 – PHENYLACETATE is an inhibitor of prostatic growth and development in culture. 8/23/1996 – Activation of a human peroxisome proliferator-activated receptor by the antitumor agent PHENYLACETATE and its analogs. Biochem Pharmacol. 1996 Aug 23;52(4):659-67. Laboratory of Molecular Carcinogenesis, National Cancer Institute, Bethesda, MD, USA. 9/1996 – The differentiating agent PHENYLACETATE increases prostate-specific antigen production by prostate cells. 12/1996 – Up-regulation and functional role of p21Waf1/Cip1 during growth arrest of human breast carcinoma MCF-7 cells by PHENYLACETATE. Cell Growth Differ. 1996 Dec;7(12):1609-15. Laboratory of Cellular and Molecular Biology, Gerontology Research Center, National Institute on Aging, NIH, Baltimore, Maryland, USA. 1. SAMID, 0., Shack, S., and Myers, C. Selective growth arrest and phenotypic reversion of prostate cancer cells in vitro by nontoxic pharmacological concentrations of PHENYLACETATE. J. Clin. Invest., 91: 2288- 2295, 1993. 2. SAMID, D., Ram, Z., Hudgins, W. A., Shack, S., Liu, L, Walbridge, S., Oldfield, E. H., and Myers, C. E. Selective activity of PHENYLACETATE against malignant gliomas: resemblance to fetal brain damage in phenylketonuria. Cancer Res., 54: 891-895, 1994. 8. Shack, S., Miller, A., Liu, L., Prasanna, P., Thibault, A., and SAMID, D. Vulnerability of multidrug-resistant tumor cells to the aromatic fatty acids PHENYLACETATE and phenylbutyrate. Clin. Cancer Res., 2: 865-872, 1996. 25. Shack, S., Chen, L-C., Miller, A. C., Danesi, A., and SAMID, D. Increased susceptibility of ras-transformed cells to PHENYLACETATE is associated with inhibition of p2i isoprenylation and phenotypic reversion. Int. J. Cancer, 63: 124-129, 1995. 29. SAMID, D., Shack, S., and Sherman, L T. PHENYLACETATE. A novel nontoxic inducer of tumor cell differentiation. Cancer Res., 52: 1988- 1992, 1992. 30. Thibault, A., SAMID, D., Cooper, M. A., Figg, W. 0., Tompkins, A. C., Patronas, N., Headlea, 0. J., Kohler, 0. A., Venzon, 0. J., and Myers, C. E. Phase I study of PHENYLACETATE administered twice daily to patients with cancer. Cancer (Phila. ), 75: 2932-2938, 1995. 8/1997 – Modulation of radiation response of human tumor cells by the differentiation inducers, PHENYLACETATE and phenylbutyrate. Int J Radiat Biol. 1997 Aug;72(2):211-8. Armed Forces Radiobiology, Research Institute, Bethesda, MD, USA.